Too bad they draw ants. Note: These fragrant beauties are Peonies, which come in just about every color except blue. Ants feed on the sweet nectar of the buds and don’t harm the plant, or so the experts say. Best for growing zones 3-8. This entry was posted in Seasonal and tagged ants, Haiku, peonies. Bookmark the permalink. I have pink peonies in my garden! I did not know that they attracted ants – I have problems with the little buggers every year and now I know why! I’ve seen pink peonies, and they are beautiful. Lucky you, having them in your garden, Lucy! I think the ants only prefer them when they’re in the bud stage, or maybe they lick off all the sweet juices before the buds can flower. Who knows? I am very lucky to have such lovely things surrounding me. Those ants are tricksy beasts, who knows what their dastardly plan is? I am afraid to say that I see them off with boiling water. Does that work?? I’ll have to try it. Not on the peonies, for this bunch belongs to a neighbor, but when those spies sneak inside looking for food. Don’t they know Dallas snatches up everything that drops to the floor?!? It certainly works on British ants! Don’t let Dallas eat them – they will tickle his tummy haha. The ants aren’t at all a problem for peonies. It used to be believed that they helped the buds to open, but it seems that’s not so. They only enjoy the sticky sweetness of the buds. When I was growing up, peonies were traditional grave flowers, partly because the plants would overwinter and come up again in the spring. By Memorial Day, they usually were blooming, and the cemeteries were beautiful as a result. Cemetery flowers? Well, yes, I can see where they’d be delightful additions anywhere! The cemeteries down South tend to plant crepe myrtles, perhaps because they’re easy to care for and quite prolific. I guess peonies share some of those characteristics. I’ve seen ants crawling on the flowers, though, and that kind of makes me itch! Maybe, if the ants would just stay on the peonies and not venture indoors, it would be okay. I do love Peonies and actually without the ants, the blossoms will not open. The ants open them ;) Sadly, it makes bringing them into the house a bit tricky tho. I’ve heard this about the ants, Morgan, and I guess they’re doing their job, for I can’t recall ever seeing a blooming peony without its share of ants! Of course, one has to be careful bringing cut roses inside, too. I’ve washed many a tiny spider down the drain doing that!! Ants belong outside, Professor. *shudders* Having an army of the little buggers march inside is NOT a vision I want to have. Poor Dallas would never be able to herd them back outside! Ants have already made their presence known here, FF. Like the Professor says, they’re like an army, marching in (but never out!!) Glad you’re stocking up! Peonies are absolutely delightful. The aroma is even lovelier than a rose. Some day I’m going to plant some. Suzi, I must confess I didn’t want to get too close to these beauties — the ants, you know! — so I’ll take your word on their aroma. Seems like we might have had some when I was a kid, but I suspect the ants was the reason we no longer do! Ah, yes. The ants loves the peonies. They do come with a price! Like roses and thorns. Shelties and shedding. And a whole host of other things that cost time or money, right?!! Thank you, John. Glad to share them with you! *inhales deeply* Love their scent. 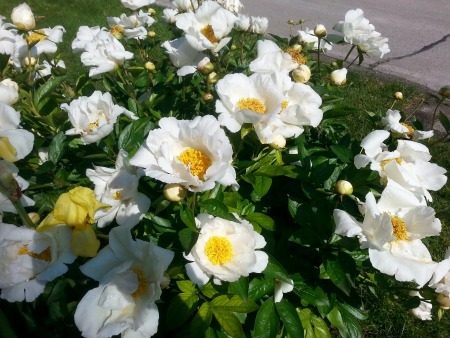 Debbie, it’s ironic you posted about peonies because I just recently spent an afternoon sitting in one of my favorite parks and the peonies were in full bloom! And OMG…their aroma was pure heaven! I love the scent of peonies! I had no idea they came in various colors though, I thought they were only white. Beautiful photograph, my friend! Have a delightful rest of your week! Awww, one of my childhood flowers. OOOOOO, that scent sends me back to JOY and LOVE and Orange Kool-Aid! Just what I’ve been waiting for….some of your spring flower pictures and I was NOT disappointed! Beautiful!! Thank you, Tanya — I love that they gave you so much pleasure. Happy Memorial Day! Beautiful! My mom’s neighbor has a pretty pink Peony bush. And this might explain the ant problem they’ve been battling in their town homes! The ants are supposed to STAY on the Peonies, Tee. Maybe nobody told them that!! I can almost smell their lovely fragrance from here. I have pink peonies in my yard and always look forward to their return. These white are very pretty. I don’t know that I’ve seen them before. I’ve seen pink ones and they’re gorgeous. Do you happen to know if they smell different based on their color (like roses)?